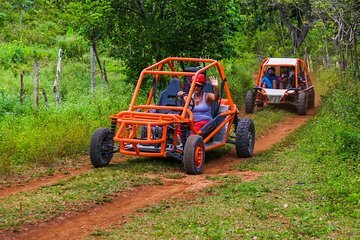 Go off-road in your own Flinstones-themed buggy during this 4.5-hour adventure from Punta Cana. Led by a local adventure guide, follow an off-road trail into the countryside, stopping at a typical Dominican market to taste local coffee and cacao. Travel past colorful houses and across a landscape of banana plantations and farmland filled with sheep, cows and pigs. Get fantastic views of the rugged coastline on the way to the Fantasy Cave and Bedrock City, a Flinstones-themed attraction. All equipment and round-trip transportation from Punta Cana hotels are included.